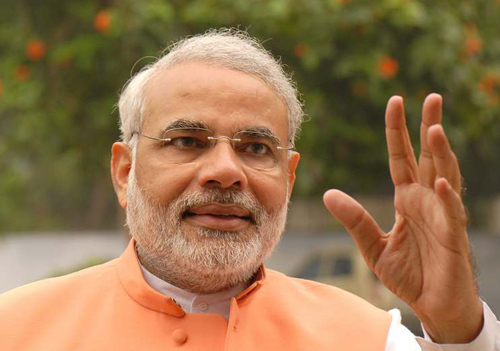 Who is afraid of Narendra Modi? 18 March 2014: Narendra Modi, if you did not know already, is Gujarat Chief Minister since 7th October 2001. He joined Rashtriya Swayamsevak Sangha (RSS) in his teen years and was seconded to leadership roles within its political arm, Bharatiya Janata Party (BJP). He was re-elected to become a fourth consecutive term as CM in December 2012. For the third time, he led BJP to decisive electoral victory in the state. 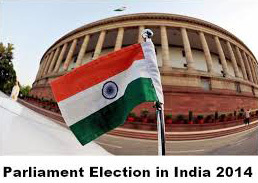 His increasing clout within the party was confirmed in March 2013, when BJP national executive led by party president Rajnath Singh nominated him to lead its election campaign to 16th Lok Sabha (LS). The party rivals of Narendra Modi belonging to the old guard, from LK Advani camp, sulked for a while. They eventually fell in line with the party decision. They recognized his strong mass appeal among its grass-root workers and RSS cadre. LK Advani, his mentor and protector as Union Home Minister in Atal Bihari Vajpayee-led NDA Union Cabinet, displayed his displeasure. He resigned from key party posts. The gods are arraigned against LK Advani. He strongly and rightly believes that the credit for the rise of BJP parliament seats from 2 in 1984 to 163 in 1996 is his and his alone. He is the hard-liner Hindutva face of BJP. In 1986, following the 1984 electoral debacle under the moderate Atal Bihari Vajpayee’s leadership, he took charge as the party president. He coaxed the party to discard the ambivalent and softer approach of his senior and projected hardline Hindutva as its core ideology. He won back the confused and frustrated Hindu communalists to party fold. He is a pioneer of Rath Yatras. 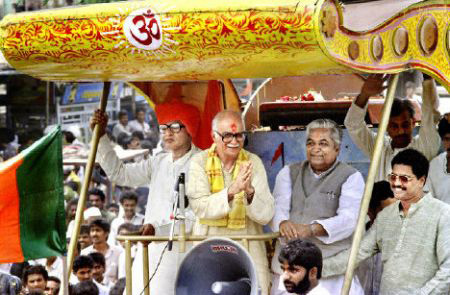 The most controversial Ram Rath Yatra of Advani is linked to the Mandir-Masjid dispute. 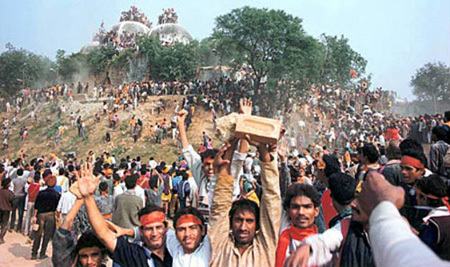 This yatra stirred Hindu religious passions; one of the consequences was the demolition of a structure from the Mughal era, known as the Babri Masjid. Hindus had disputed ownership of the site; their claim was that Lord Rama was born at the site. According to them, Babar had destroyed the old temple there and built a mosque bearing his name on temple ruins. They wanted to rebuild the temple at precisely the plot on which the mosque stood. Lakhs of party loyalists, RSS cadre and general Hindu populace had converged at Ayodhya heeding the call to offer volunteer service (Kar Seva) in rebuilding the Ram temple. On 6th December 1992, the assembled volunteers ran berserk spurred on by toxic rhetoric of speeches made at the convention. They broke security cordon, climbed over the fence of the compound wall housing the mosque and demolished it. 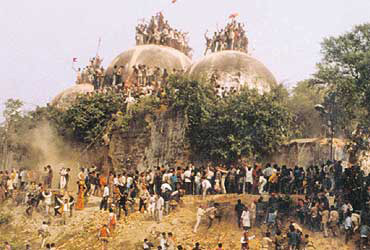 This historic event marked the low point in relationships between Hindu and Muslim communities, further escalating communal tensions. Advani with his brand of hardline political Hindutva had arrived. His twin goals were achieved on that day. His moderate party colleagues were cut down to size. The Muslims were angered and frustrated with Congress Party under PV Narasimha Rao for the ineffectiveness of its Union Government to prevent ‘the attack on Indian secularism’. They were expected to punish it at the polls. LK Advani and BJP were right in their calculations. However, destiny played cruel joke on him. Vajpayee became PM riding the success that LK Advani engineered. He had to be content with playing second fiddle. His hour under the sun arrived when BJP lost the 2004 elections. As expected blame game began with confusion on Hindutva. Hard-liner ideologues s blamed it on Vajpayee’s betrayal. Moderates blamed it on Advani and the opposition’s success in polarizing minority and moderate Hindus against it. I quote from an op-ed from party ideologue and close confidante of LK Advani, Sudheendra Kulkarni: [The defeat] has to do with the widespread ideological confusion within the party over what the BJP’s advocacy of Hindutva actually means. The confusion has persisted for a long time, but it intensified after the defeat of the BJP/NDA in 2004. There was a strong view within a section of the party — and a much stronger and almost unanimous view within the larger Sangh Parivar — that the Vajpayee’s government was defeated because the BJP had “abandoned Hindutva”. Translation: Blame Vajpayee and his compromises to gain and keep NDA allies for the 2004 defeat. Exit Vajpayee; enter LK Advani. As PM-in-waiting, he led the party to a successive defeat in 2009. 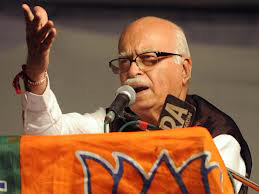 LK Advani activated a three pronged strategy: 1) the aggressive Hindutva showcasing minority appeasement intended for its Hindu base, 2) development for the uncommitted and 3) anti-government rhetoric on the failures in war against terror and taming Pakistan (exemplified by 26/11 Mumbai Siege). Translation: BJP’s minority policy is dysfunctional. Though a section of top leadership, realized post-2004, that its Hindutva plank, misused by saffron toughies against Muslims, Christians, Adivasi, Tribal, Dalit and lower caste Hindus to show their place as social untouchables, must be redefined as benign and desirable cultural nationalism. It should talk of secular as a noble social objective while condemning those who distort the ideal in practice to promote communal divisiveness. In the same manner, it should condemn and punish those within Sangh Parivar of distorting Hindutva into majority communalism. Is history repeating itself with superficial changes like substituting LK Advani with Narendra Modi? Will BJP under Modi rise to address its internal conflicts? Having examined the BJP and RSS fault-lines, I provide a clue to the question: Who is afraid of Narendra Modi? RSS will have a lot to be afraid of him, if he succeeds in turning his pan-Indian acceptance, as todays’ most eligible PM candidate, into votes for his party and if BJP emerges with a simple majority on its own. For, in his rallies since June 2013, despite being only negative about UPA’s failures, he has not uttered anything about Ram, temples, minority appeasement, and so forth. He has spoken of faltering economy under UPA, projected Sardar Patel as his role model, and rhetoric against Nehruvian economic model. Narendra Modi can only get the simple majority by retaining the RSS-aligned Hindu base, convincing the non-committed Hindu voters (who do not necessarily give a damn about Hindutva) that his priority is economic development and not divisive religious agenda, and attracting young educated youth among minorities based on aspirational appeal. He would become PM, not solely by the blessings of RSS, thus liberating himself from the iron grip of saffron ideologues. He will be congressified like Sardar Patel. We should know that it was Sardar Patel, a RSS sympathizer in Congress Party, who came hard upon RSS post-assassination of Mahatma Gandhi in 1948. Modi managed to win simple majority for BJP on its own. By end of week, he would be our PM. I quote the key paragraph of this article: Who is afraid of Narendra Modi? RSS will have a lot to be afraid of him, if he succeeds in turning his pan-Indian acceptance, as today s most eligible PM candidate, into votes for his party and if BJP emerges with a simple majority on its own. Those BJP leaders who showed less than spirited support to Modi since his elevation to lead the party are running for cover and seeking RSS intervention to safeguard their interests. Could RSS now tame Modi? Well, the country could be liberated from both parivars, Gandhi dynasty and sangh. An in debth article giving insight to the wrong and un wanted attitude of political parties. let us hope and pray for a poluplist, corruption free sarkar. It least I agree with the statement of Kulkarni \"We harped too much on the UPA government\'s failures, without convincing the people how we would perform better.\" Secondly, RSS agenda is afraid of Modi as their agenda is not perused effectively by Modi so once again creating confusion among BJP supporters. Well said Philip. Good analysis, waiting for more insight into the LS elections in the coming weeks.. Bold article. BJP is certainly riding high on religion sentiments forgetting India belongs to all religion. Except AAP all are favoring religion in one way or the other. BJP does it little more and openly with RSS in their fold. India will improve only when religion and politics is separated. As of now every regional and national party is relying religion and cast to get power. It may take few decades to get better or to get even worse? Religion is for personal practice. I get upset that democratic values are being replaced by religion issues by our politicians! Good analysis sir. My only wish is to have a corruption free, pro-active, development oriented, people friendly youth government.